How much would a handyman charge to install track lighting? The installation cost for track lighting will vary based on the availability of electricity at the location and the cost of the fixtures chosen. 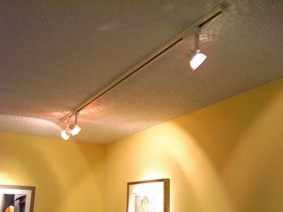 If there is an existing light fixture nearby then it is relatively easy to add the wiring needed for the track light. To reuse existing wiring, repair drywall. 2 Hours at $35/Hr. To run new wiring and switch 4 Hours at $35/Hr plus materials.